A winning blue ribbon lapel pin great for any rider or winner in your life. 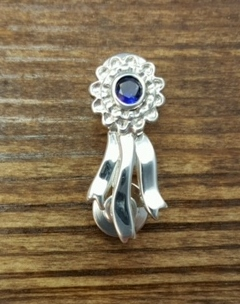 This Sterling Silver Ribbon is set with a 1/2 carat lab created Sapphire. Also this pin offers 2 locking clutches for extra security, it is rhodium plated for a bright white finish, and looks great on any lapel. Also available in 14kt yellow gold and 14kt white gold. PICTURED AND PRICED HERE IN STERLING SILVER!